Down the backstreets in Istanbul, you’re bound to find some type of interesting architecture dating back a few hundred years. One of my favorite areas to wander was Eminönü, home to the tantalizing scents of the Spice Bazaar. Past the smiling sellers touting everything from handmade wooden spoons and baskets to local Turkish cheeses and coffee, you could even miss the doors to one of my favorite mosques here. The Rüstem Paşa Mosque, built in 1560, is one of the city’s architectural gems. Designed and built by the great Ottoman architect Mimar Sinan, who also designed the nearby Süleymaniye Mosque and other impressive structures in Edirne, planned Rüstem Paşa Mosque with a unique octagonal plan. Although small, the mosque is covered with intriguing Inzik painted tiles, particularly in vibrant red, which was a difficult color to obtain back in the day. Also, as you look around, be sure to notice also the kündekâri doors of carved and inlaid wood and the intricate gilded trim high on the walls and ceiling in the vestibule. The mosque truly is a work of art! A bit of interesting here is that the mosque was paid for by Rüstem Paşa, one of the wealthiest men in the Ottoman Empire as well as the son-in-law and a grand vizer of Sultan Süleyman the Magnificent. Of course, his namesake mosque couldn’t rival that of his master’s so he selected a site amid the busy market, just downhill from the Süleyman's grand mosque. Rüstem Paşa also is remembered in history for having plotted with Süleyman's wife, Hürrem, to denounce Prince Mustafa, Süleyman's son and heir to the throne. Süleyman had Mustafa beheaded, which allowed Hürrem’s son, Prince Selim, to inherit the throne after the sultan’s death – and this started the long decline of the Ottoman Empire. What drama! 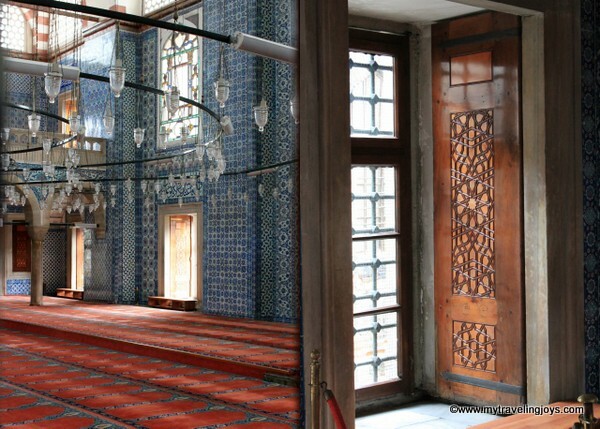 Anyway, the Rüstem Paşa Mosque is definitely worth seeking out when you visit Istanbul, don’t you think? I’m linking this post to the monthly travel guide link up organized by Fiona, a fellow Australian blogger, at Tiffin Bite Sized Food Adventures. Each month features a new letter of the alphabet. This month is the letter “R.” Please pop on over to Fiona’s blog to read more travel stories or feel free to link up your own! This is a very beautiful building with such intricate decoration. I must get there one day!